In the general effects order article, we investigated the art of putting your guitar pedals in order. I also mentioned that ”before or after distortion” is the main question for many of the effects out there, and that question becomes vital when it comes to using (or not using) the amp’s effects loop. There are people who claim that certain effects must go in the effects loop. Personally, I don’t believe in universal truths. I am willing to go as far as to say that some types of effects may sound better when hooked up in the loop, depending on if you’re using the amp’s distortion channel or not. In the end, though, it’s down to individual taste (yours, that is). But what does the effects loop do? Sometimes there will be another preamp stage after the tone controls, where the brunt of the distortion is generated. And on some amps, the master volume is located after the reverb, right before the power amp. But the description above is adequate for the point I’m trying to make – that even the simplest of setups consists of several stages, all performing different tasks. Now, an effects loop is simply a point in this chain where you can insert an effect of your choice. Some loops are located before the reverb section, while others are located after it. A straight insert point is called a serial/series loop because it sits in series with the signal path, breaking out the entire signal out from the amp, to the effects and then returning the effected signal to the amp. Parallel effects loops are more complicated, but the general idea is the same. The difference is that while the main signal path remains intact, a portion of the signal is sent out through the send jack, and whatever is fed back through the return jack is then mixed in with the original signal. The idea here is to set the effects to 100% wet (no dry signal at all), and then use the amp’s mix control to add in the desired amount of effects. Now, to start thinking about how to use the fx loop, you must incorporate the amp’s different parts into the entire chain. When dealing with floor effects pedals, one will usually arrange them in a certain order, to get the desired results from them. Chorus before distortion will sound completely different from chorus after distortion, and so on. It’s all about thinking what you want affecting (or effecting, rather) what – do you want your guitar, with phaser added, to be distorted? Or do you want your distorted guitar to be processed through the phaser? The same principle applies to using the effects loop – the stuff you place there will process the guitar sound, including any impact the preamp (including any distortion generated there), tone controls etc has already had on said sound. So… if you use lots of preamp distortion, sticking a chorus pedal in front of the amp will be the same as placing it in front of a distortion pedal, which you may or may not like. If you do like it, just let it be – you don’t need to mess with it any more. But if you want to try it after the distortion, things get a little trickier – since the distortion is coming from the preamp, you can’t simply move the chorus to the other side of the distortion box… and here’s where the effects loop comes in. By running it in the loop, you are actually placing it after the distortion. Neat! The difference will be even greater on delay pedals, since adding lots of distortion after them will make the repeats (which generally will play back at lower volume than the actual playing) louder. But that still doesn’t mean that you should always, in any situation, use the effects loop – after all, if you’re getting all your distortion from a box on the floor, all you have to do is make sure the delay goes after the distortion pedal, and you’re fine. On a clean amp, using the loop will only move the pedals you place there behind the tone controls, which will only make a slight difference. And there are instances where the loop’s placement in the chain really works against it. For instance, if your amp happens to have the fx loop after reverb and you stick your chorus and delay in there, you will end up with chorused and/or delayed reverb… which may or may not be what you’re looking for. It definitely isn’t my cup of tea, though. So when do I use the fx loop? On an amp where you use the distortion channel, you may want to try at least delay and reverb in the loop. If you have a tremolo pedal and plan on using it on the distortion channel, stick it in there as well. Chorus, flanger, phaser etc are up to individual taste, and should be experimented with. Also, sticking a booster or eq pedal in the loop will give you far greater control over the overall volume, compared to in front of a distorted preamp. On a clean amp (or at least one where you don’t heavily distort the preamp), I never bother with the loop. Taking the signal out of the amp (and lowering the level to fit stompboxes, then re-amplifying it again) can damage the tone far more than any benefits you’d reap from moving certain effects after the tone controls. 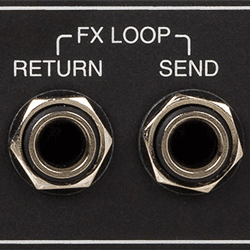 One final tip – if you have an amp that has a serial effects loop placed after the reverb, you have the perfect place to hook up a tremolo pedal. That way, the tremolo will most closely mimic that in a good old Fender amp (i.e. tremolo-ing everything, including the reverb), which sounds great! But don’t let anyone tell you that you have to (or shouldn’t) use the loop for certain effects – nothing is that simple, and there are no universal truths!